Wow what a wonderful week the sisters have had! In the last 7 days Sisters in Song have completed 4 very different but nonetheless memorable gigs….and Christmas is still round the corner! On Saturday they helped the Berry family celebrate an intimate 75th birthday party for beautiful Barbara in a breathtaking country home out near Ashley; only a 40 guests but the evening went smoothly and everyone had a blast. Sunday evening saw Maria and Tracey at the grand re-opening of Cheadle Hulme’s best Chinese restaurant Rainbow88; the sisters have never been on the same bill as a Chinese dancing unicorn so it’s definitely a night that will go down as one of their most unusual bookings! Monday afternoon saw the girls at The Mere Court Hotel & Conference Centre near Knutsford for a ladies Christmas charity luncheon in aid of the Alzheimer’s Society; 150 guests in the hotel’s delightful conservatory enjoyed excellent cuisine, festive treats and fabulous entertainment courtesy of Santa’s little helpers….Sisters in Song! 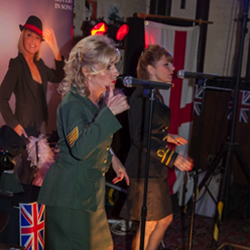 Last Friday night the girls provided entertainment at a themed WW1 Evening at The Bridge Hotel in Prestbury; the restaurant was buzzing as SiS lead the chorus of wartime favourites like Bless ‘em All and We’ll meet again late into the evening….a nostalgic and uplifting end to a tiring but rewarding week of song and banter!